The youth soccer season has started in suburban neighborhoods across the country. Maybe you’re looking for a way to get involved in your kid’s team in a way other than coaching, cutting orange wedges for halftime, or cheering from the sideline. One way you can make your contribution is with your iPhone and SoccerCard SKS. With this $3 iPhone app from Site K Studios, you can make virtual sports cards for each player, and even keep track of their statistics during the season. Hat Trick Heroes: SoccerCard SKS lets you use photos taken with the iPhone camera or any photo in your iPhone's Photo Library. 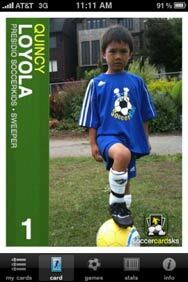 The first step in creating a player card in SoccerCard SKS involves the player photo. (Let’s be honest, this is probably the most important step, because no athlete wants a lame photo on their card.) You can use the iPhone’s camera to take a player photo, or you can use a photo already in your iPhone’s Photo Library, a nice touch if you’d rather use a camera that produces better image quality (or if you’re an iPod touch owner). Once you select/take a picture, SoccerCard SKS automatically places it in its template, which has a column along card’s left side that displays the player’s name, team name, position, and jersey number. The template looks professional, but it has its restrictions, the most important one being that you can’t reposition the photo or zoom in or out. The built-in instructions advise you to take pictures with the player slightly shifted to the right of the frame (it also advises that you use the iPhone camera for portrait or still shots only, which is a good idea). If you want to make cards that will make the folks at Upper Deck proud, you can take action shots with a SLR, crop them appropriately to make room for the left column, transfer the photo to your iPhone, and then import the photo into a new card in SoccerCard SKS. Another important restriction with the card template is that you can’t customize the template’s green, white, and yellow color scheme to suit your team’s colors. I have two sons playing soccer, and SoccerCard SKS’s colors actually match my oldest son’s team, but the card colors clash with the blue and white of my youngest son’s team. 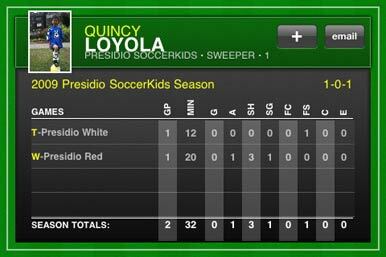 Beyond the player photo on the card, SoccerCard SKS lets you track a player’s statistics for each game during a season. It’s easy to enter stats, and SoccerCard SKS tracks the player’s minutes played, goals, assists, shots, fouls committed, and more. After you’ve entered a player’s stats for a game, it appears on a line on the “back” of the card, which shows four games at a time and allows you to scroll with a finger flick to see other games. Parents who are in it for the fun of the game may find such stat tracking unimportant (especially for younger kids involved in “bunch ball” games where the score isn’t officially kept), but it’s quite satisfying for kids who are in more competitive leagues to see the numbers. SoccerCards SKS lets you send the stats over e-mail; the card is formatted in the e-mail using HTML, not as a file attachment. Unfortunately, you can’t send the “front” for the card—the part the grandparents care about—over e-mail directly from SoccerCard SKS. However, you can take a screen shot and send it from your iPhone, and a similar method to this is suggested by the developer for posting to Facebook. The problem with this method is that the screen shot is of the whole iPhone screen, which includes the app’s interface and the top bar; it doesn’t isolate the card itself. Each card lets you track player's stats for each game in a season. Having a virtual sports card on your iPhone is fun, but it doesn’t compare to the excitement of having an actual printed card. SoccerCard SKS doesn’t have any print features, but you can figure out a workaround. I created printed cards by using screen shots of the “front” and “back” of a player card (press the Home button and the Sleep button simultaneously on the iPhone to take a screen shot) transferred to my Mac. I opened the “front” in Photoshop and printed it on card stock. (I cropped out the app interface, but since the stats use the whole iPhone screen, it is larger than the player photo screen and I had to resize.) I then flipped the card stock over, and printed the other shot, making sure that the second image ended up on the back of the first image. After the print finished, I trimmed it to card size. The developer says that they are looking into partnerships that will allow you to send the card to be printed directly from the app. Even with some limitations, SoccerCards SKS is a fun iPhone app that can help make your your player more enthusiastic about youth soccer. It can even track game stats, if you’re into that sort of thing. SoccerCard SKS is compatible with any iPhone and iPod touch running iPhone 3.0 software or later.